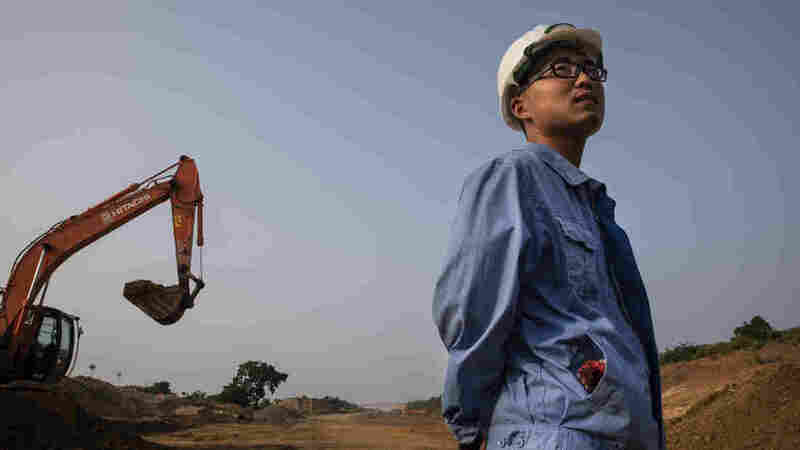 China's Global Construction Boom Puts Spotlight On Questionable Labor Practices Chinese companies are recruiting workers from home and subjecting them to harsh treatment abroad. In one case, laborers brought to the U.S. were forced to work 14-hour days without pay. A Chinese site engineer is seen during construction of an extension of the Southern Expressway in Sri Lanka, in November. The project is part of Beijing's massive Belt and Road Initiative. A Brooklyn jury heard testimony earlier this month of virtual slave labor — 14-hour days without pay and threats of physical violence — for Chinese laborers constructing Chinese government buildings in the United States. Federal prosecutors laid out how Dan Zhong, a director at construction group China Rilin and a former Chinese diplomat, coerced workers to help build Chinese state facilities, including China's embassy in Washington D.C., by confiscating their travel documents and forcing them to pay security deposits to ensure they would not leave. He then locked the workers in squalid New Jersey housing "trapped by guards who would hunt them down and drag them back if they escaped," William Sweeney, a FBI assistant director, said in a statement. Zhong was found guilty earlier this week in New York federal court of using forced labor. His co-defendant, Landong Wang, is currently a fugitive. The case starkly highlights a practice by Chinese construction companies, who have long relied on an informal system of labor contractors who charge workers a hefty recruitment fee for lucrative work abroad. That raises the risk of exporting shoddy labor practices globally, according to labor experts. At the same time, these companies have increasingly looked abroad for projects as an economic slowdown and regulatory tightening halt projects at home. They are finding plenty of opportunities; China's Belt and Road Initiative, begun in 2013, aims to fund and construct infrastructure and commercial projects in more than 60 countries. "Many Chinese companies fail to adapt their practices to comply with local laws when operating abroad. The Chinese government has policies requiring adherence to local rules, but most lack any teeth," says Aaron Halegua, a lawyer and research fellow at New York University School of Law. Meanwhile, China Rilin is not the only Chinese company linked to a U.S. federal court case this year. State-owned group MCC, the Shenzhen-listed company Gold Mantis and Hong Kong-based Imperial Pacific are being sued by seven Chinese construction workers in Saipan, which is part of a U.S. commonwealth. The workers allege the firms duped them into paying steep recruitment fees in exchange for high-paying work on a Chinese-funded casino on the island. Instead, they and other workers say they were paid below minimum wage and subjected to dangerous working conditions. None of the three companies returned a request for comment. "The construction site was a mess, unlike other Chinese construction projects I have worked on. Litter and materials were left around the site. ... People often worked without safety harnesses," remembers Ren Zhijie, who was among hundreds of Chinese workers brought in to construct the casino. He returned to China after the FBI raided the site after a worker death in 2017 and is still waiting for his recruitment fee to be returned. Zhong, the director of the American subsidiary of China Rilin, had been tasked by China's foreign ministry to help construct various state facilities, such as China's mission to the United Nations in New York City and consulates across the U.S.
For national security reasons, China and the U.S. allow each other to bring over their own personnel to construct diplomatic facilities. However, FBI investigators say Zhong forced Rilin's employees to do other unpaid work, such as preparing meals for him and working on commercial properties in New York City. The lack of compliance from Chinese firms operating abroad leads to a dual standard, said Halegua: "These workers lived in a residential community and labored alongside U.S. workers. But the contracts they signed in China, security deposits they paid and the employers' threat to punish whoever tried to escape created a climate of fear and coercion." Zhong's boss, China Rilin Chairman Wang Wenliang, rose to prominence operating ports along China's border with North Korea and through construction. Beyond constructing embassies in the U.S., Wang also made political inroads in America. Although Wang is a Chinese citizen, his permanent legal resident status in the U.S. allowed him to donate to American organizations. That included $120,000 to former Virginia Gov. Terry McAuliffe's 2013 gubernatorial campaign and inauguration through a China Rilin subsidiary and a $2 million pledge to the Clinton Foundation. In 2014, Wang gave a founding grant to a prominent Washington think tank, the Center for Strategic International Studies, to launch its Zbigniew Brzezinski Institute of Geostrategy. At one point, Wang's lawyer, Mark Feng, was Brzezinski's research assistant at Johns Hopkins School of Advanced International Studies, H. Andrew Schwartz, CSIS' chief communications officer, said in a statement. "Neither Dr. Brzezinski or CSIS had anything to do with any business activities of Rilin and were never asked to do anything regarding commercial activities. ... We have had no contact with them in over 3 years," the statement said, noting that CSIS' CEO, John Hamre, did meet Wang on three occasions but only to discuss Sino-U.S. relations. However, Wang's fortunes have fallen in recent years. In 2017, he was one of 45 legislators removed from China's parliament over a massive vote-buying scandal. Not long after, Dandong Port Group, in which Wang is the largest shareholder, defaulted on more than $150 million in debts and has since had $422 million in assets frozen because of disputes over its borrowings. In 2016, the Hurun Rich Report listed Wang as the 289th most wealthy Chinese individual; the following year, Forbes' billionaires index estimated his fortune at $1.2 billion. He made neither list in 2018.